Welcome to the tenth installment of the Dollar Box, where I look at comics with an original cover price of a dollar or less. This month we travel back to the dim pre-history of Robert E. Howard’s Hyborian Age — and the even more remote year of 1973 — for a date with a certain she-devil with a sword in issue #24 of Conan the Barbarian! Following as he did Robert E. Howard’s Conan chronology, Roy Thomas knew he was years away from being able to bring the great loves of Conan’s life — Valeria and Belit — into the book, but he still wanted a strong female character for the series. Inspiration struck when Thomas learned of a non-Conan story from Robert E. Howard that featured a character named “Red Sonya of Rogatine.” Working from that tale, Thomas and Windsor-Smith constructed issue #23’s “Shadow of the Vulture,” which was also a entertaining issue, and notable for featuring the first appearance of the subtly-renamed Red Sonja, introduced as a mercenary soldier fighting to defend the besieged city of Makkalet. This story is remarkable in that it is so un-remarkable. It is bolted together from a series of familiar Conan scenes. There’s a tavern fight, a tall tower to climb, riches that are stolen (and that just as rapidly slip through Conan’s fingers), and of course a giant snake to slay. All in a night’s work for our favorite Cimmerian! What makes the story memorable is Sonja, a rogue of a different sort, an otherworldly beauty who is nearly Conan’s equal with a sword, and pretty clearly a couple laps ahead when it comes to brains. Later Red Sonja stories would make much of Sonja’s vow of chastity — and at the end of this story she does declare that no man may kiss her unless he first defeated her in battle — but in this tale Sonja seems to honor that commitment only when convenient. Distinct from the somewhat dour Red Sonja on display in her later Marvel solo series (which I review today back at my home blog, Longbox Graveyard), this Sonja is full of life, dancing with abandon on a tavern table, enjoying a moonlight swim with Conan, and teasing the barbarian with her feminine whiles. Sonja, it turns out, is leading our hero on, needing his legendary Cimmerian climbing prowess to help her scale a treasure tower, but there is still enough heat in her exchange with Conan that it doesn’t seem entirely a manipulation or a relationship of convenience. Sonja genuinely likes Conan — it’s just that she likes riches more, and when push comes to shove Sonja takes what she wants and leaves Conan in the dust, expressing his frustration with a rare ending where he didn’t get the girl by slamming his fist into a wall. Thanks for reading the Dollar Box! I’ll be back next month with another treasure from the back issue bin, and in the meantime I invite you to visit me at my home blog — Longbox Graveyard — where every Wednesday brings a fresh blog from a comic book world where it’s always 1978! See you there, by Crom! Great article! 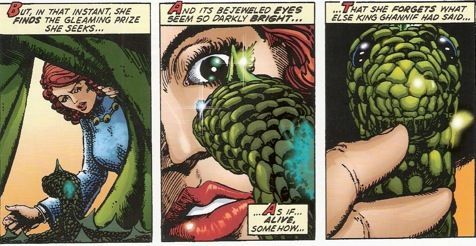 I’d have never thought that BWS was working on comics in the ’70’s, but what work he did! His attention to detail has always put me in awe, and here, it’s even more so. Very awesome to point me in another direction of his work, especially his earlier stuff! 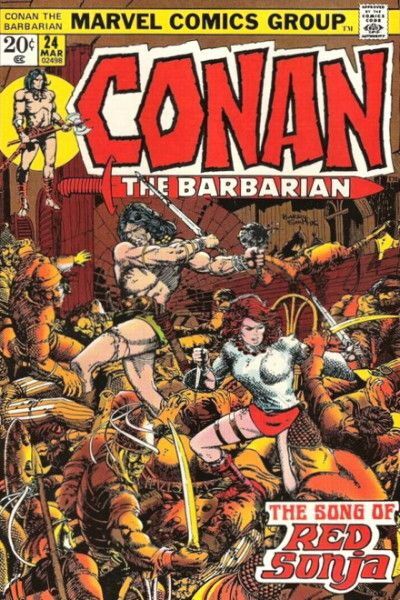 Tim, if you’re a fan of Barry Windsor-Smith then you NEED to track down the first four volumes of Dark Horse’s “Chronicles of Conan” series, which reprint the original run of Conan the Barbarian from Marvel Comics. Those volumes cover the BWS years and they are brilliant. I agree that this is a good one! This one earned a rare A grade from me when I reviewed it recently. Thomas and Smith were knocking on the door of greatness during their entire Conan run, but this was the issue they put it altogether.